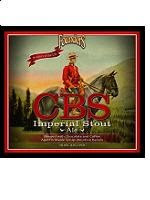 Founders Brewing Co. Vice President/Director of Marketing Dave Engbers announced last month that the highly anticipated Canadian Breakfast Stout (CBS) will be the second release in the company’s 750mL “Backstage Series”. It will be released to the market on October 3, 2011, with a taproom release party on October 1.
remain intact once the taproom doors open. CBS will be featured on draft, and CBS merchandise will be available in the Founders company store, which is on the north end of the taproom. As with all Founders specialty products, growler fills will not be available for CBS. There has been a great deal of anticipation and speculation regarding the upcoming release after the success of Blushing Monk, the series’ debut, earlier this year. Canadian Breakfast Stout is the epitome of why Founders launched the Backstage Series: it brings some of the brewery’s most sought-after beers, which have been available primarily at the taproom or at a few select events, to a much larger audience. Canadian Breakfast Stout is an Imperial Stout brewed with a blend of coffees and imported chocolates, then aged in spent bourbon barrels that have most recently been aging pure Michigan maple syrup. The final product has had stellar reviews and is currently the fifth highest rated beer in the world on www.BeerAdvocate.com. The company expects to release one more product in the 2011 Backstage Series later this year.